With five Premier League goals already in April and a hat-trick only three days earlier, when Sergio Aguero saw his blatantly offside goal allowed to stand, he must have fancied making major inroads on his second century of goals before the conclusion of last night’s match. Sergio Aguero made it 100 Premier League goals with that header and the Sky Sports presenters were just so pleased that their pre-ordained script had been followed, it was through gritted teeth and a fair few minutes passing, before they were embarrassed into admitting it shouldn’t have stood. Aguero standing offside in the build-up, offside when Kolarov made his run up to the ball and then offside as the ball was struck into the box. Sergio Aguero is far too good to then be given such extra help and after seeing what the Argentine striker and Kevin de Bruyne had done at the weekend to Chelsea, Newcastle fans feared we could see something rivalling that 20 minute implosion at the Etihad earlier this season. As Newcastle were rocked by the goal and the injustice, a killer second was almost lapped up by a grateful Manchester City. Under no pressure, Jamaal Lascelles (who was last man) tried a shocking pass and gifted the ball to Kevin de Bruyne, furious backpedalling Lascelles tried to put doubt in the Belgian’s mind as Aguero ran to one side of him while de Bruyne went the other way. Advancing to the edge of the area, the Manchester City attacking midfielder had a clear strike but thankfully sent his effort wide of Karl Darlow’s goal. After that though, I have to say that once again Jamaal Lascelles didn’t put a foot wrong on the pitch and was faultless off it as well. After the final whistle and Lascelles & Mbemba undoubtedly winning on points against the world class Aguero and de Bruyne, Newcastle United’s man of the moment was happy to talk us through the game and what the result & performance mean for the coming weeks. It is all quite head spinning, expectation have become so low not only on the pitch but also off it, that we are quite stunned by what Jamaal Lascelles has had to say in recent days. The disgraceful situation that has been allowed to exist where a Newcastle Captain and Aguero’s compatriot stands for years without making a single TV appearance to represent the players and club, is now shown to be even more embarrassing. Never mind some of his on-pitch displays in recent seasons…. 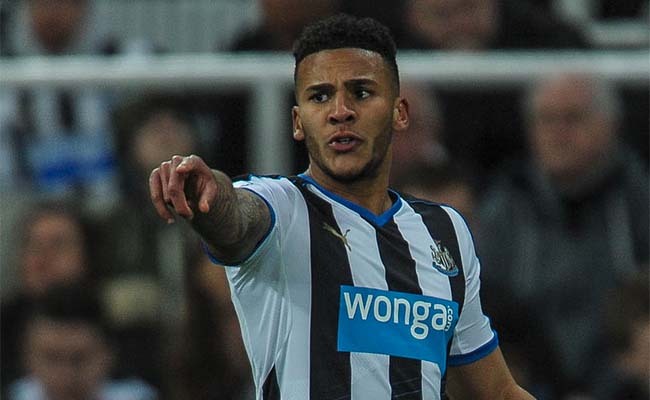 A young and inexperienced player like Jamaal Lascelles has on his own initiative taken it upon himself to tell the players that they have been a disgrace and have to be better, whilst also communicating with the fans via the media, reassuring us all that there are some Newcastle players who do actually care. It has been quite the revelation. In the aftermath of Sergio Aguero and the draw v Manchester City, Jamaal Lascelles obviously wasn’t fazed by the opposition or the occasion. “We had to keep the same attitude we had against Swansea, and we did that. Our preparation for this game’s been excellent. We knew it was going to be a massive game and we’ve taken it really professionally, and it showed today. “There were a few times when we got them on the break, and with Gini’s chance at the end, I thought ‘we could nick something here’. “But it was a great effort from the lads. Obviously on paper, people would have had Manchester City down to beat us, so it just goes to show that if you have that fight and passion, you can do what you want on the day, and I’m really pleased for the boys. “Ultimately, for me as a defender, I’m really impressed with the way everyone was defending. “I just try and do my best for the team, really. I just keep trying my hardest and that’s all I can do – just do my bit for the team. “More so, I like to communicate to others and boss people about, because I think that’s what we’ve lacked and that’s what we’ve needed. “It’s a massive test, but we’re really looking forward to it. Obviously it’s nice that we’ve got a game coming round the corner again, but we’ve got to just take it game by game, step by step. “I don’t really look at the table too much. I just tend to take things game by game, because we can’t really affect the other teams around us. But we’ve got to keep our heads. We can’t get complacent because we’ve had a win and a draw, we’ve not had it much this season, so the main thing for us is to stay professional.